The doors will be open this Saturday night at the Trust the Process group, which meets at 8pm at Highlawn Presbyterian. The Out of the Dark and Into the Light of the Rainbow group will be closed this Saturday, November 1, due to the MRSCNA Convention in Ripley. Please consult the GTO Area schedule for other meetings in the GTO area that day. Clean Possibilities, which meets on Tuesdays at 7pm at the Barnett Center, will not be meeting on November 4th, because the facility is being used for another reason. Please see the schedule for locations and times of other meetings in the GTO area that day. We apologize for any inconvenience this may cause. There will be a four-year celebration at the Hope Through Surrender meeting on Thursday, November 6th. The meeting begins at noon, and takes place at 901 Jefferson Ave. at the Second Presbyterian Church. There will be a discussion recovery meeting and cake. Hope Without Dope will have a home group member celebrating 10 years on Sunday, October 19th at 7pm. There will be cake and refreshments and a discussion meeting. Another Look group of Narcotics Anonymous is starting a new meeting on Tuesday nights at 7PM. The meeting will be held at Tri-State Worship Center - The Point Church at 901 Solida Road, South Point, OH, just off of new 52 at the Solida road exit. All is well at the Hope Without Dope group of Narcotics Anonymous. The doors are open on time, literature is on the table, coffee is hot, and the NA message is being carried. We have 50-60 in attendance every Sunday. We have no donation to area this month. Our votes on current motions are as follows: YES on the motion brought by the Not High Noon group to have an Area Inventory Ad Hoc. YES on the motion brought by Against All Odds for the area to provide 20 Regional schedules to all homegroups monthly. - Grateful to serve, Jason L.
Everything is going well there has been a shift in trusted servants, however we are moving right along with fulfilling our primary purpose. Attendance is steady 10-15 member per week. We do anticipate an influx as the temps begin to fall. Doors are opened on time, coffee made and literature out. We have a 12 year celebration coming up Oct. 5th Lee C. is coming from the FANA Area to speak. No donation for area at this time. - Grateful to Serve, Kristina R.
Monday noon meeting is going well with12-20 in attendance weekly. No problems to report. Literature is on the table. Open and close on time.... Wednesday men’s noon meeting. 10- 15 attending literature on table no problems. - Grateful to serve Robbie C.
The Another Way Group of Narcotics Anonymous is successfully carrying the message of recovery. Coffee is made, literature is on the table, and the doors are open on time. We have 4 home group members and around 12 people in attendance per meeting. We are asking for some support from the area for our home group. We have no donation to area at this time. Grateful to serve, Sarah K.
The Monday night “Together We Can” group is doing well. The doors are open on time, rent is paid, literature is out, and the lifesaving message of Narcotics Anonymous is being shared. We have a new home group member Hannah B. We have no donation for area at this time. Grateful to serve, Wayne M.
Hello all from the not high noon group our average attendance is 17 in a week, we have literature available and the doors are open. We have a $10.00 donation at this time. Motion- NO on area inventory, remove from policy. Grateful to serve : Brittany O.
Greetings from Clean Possibilities. All is well. Meeting is starting on time, coffee is on the pot, literature is on the table, and the lifesaving message of recovery is being shared. Our meeting attendance is around fifteen members a week. We have a 25 dollar donation at this time for area. Grateful to serve, Ryan B.
Greetings from Progress not Perfection. All is going well. Doors are opened, coffee being made, literature on the tables and message being shared. We have double celebration on Oct 15th and Nick P. will be speaking. We will also be sponsoring an addict to send to the NA Ripley convention in, if interested please see a home group member. We have an average attendance of 55-65 addicts per week and a $10 donation to area at this time. Grateful to serve, Megan C.
All is well with the Hope through Surrender group of Narcotics Anonymous. The doors are open on time, coffee is in the pot, literature is on the table, and most importantly the message of recovery is being shared. We average about 10 to 15 people per week. Grateful to serve, Tasha W.
All is well here, coffee is made, doors are opened on time, literature is on the table and the message is being carried. Average meeting attendance is 30-40. Ali S. has been elected as GSR. We would like to thank Scott M. for coming out and sharing his experience, strength and hope. Grateful to serve, Ali S.
Greetings and salutations from the freedom from self-group!!! Doors have been opening on time and the lifesaving message of coffee and Narcotics Anonymous has been brewing. Chris W. has been elected to GSR. Average attendance of our meeting is 35. We have no $ to donate this month, and will be voting no to the schedule motion and a yes to the ad hoc. Also we are in desperate need of at least one more committed home group member. Happy to serve Chris W.
Greetings from the Crossroads home group of NA. We would like to announce that the meeting will be moving on Friday the 26th to the Fairfield east on 8th avenue. and 28th street. 12:30p our average attendance is 20-25. We have no donation at this time to area. We need help with home group members. In favor of area inventory, yes on schedule motion. Grateful to serve Josh M.
servant subcommittee on a trial basis for one year. The intent being: to see how it works out. This motion was tabled back to the Areas. • On September 27th experience on: home groups, sponsorship, and service commitments. • This is concerning the upcoming fall convention. There will be two topic discussions meetings added to the Friday agenda, and six topic discussion meetings added to the Saturday agenda. • We are growing as a fellowship and reaching areas where NA hasn’t had much of a foothold before! Narcotics Anonymous is now recognized in Afghanistan and they also have a Regional Service Committee there as well. • There was a motion made at the last RSC for the region to purchase a blanket insurance policy which would cover all the meeting in the Mountaineer region, both conventions, and the RSC meetings held every quarter. The motion passed so we will be implementing this blanket policy. It was also decided that the insurance policy will have a $6,000 cap that’s not to be exceeded. The intent for the motion is to cover our asses. ATTENDANCE: TONY T, TANNER W, SCOTT W, NICK L, RUFUS, ROBBIE C, RACHEL N, LIZ, HANNA, RYAN B, STEVEN J, ANDREA W.
WITH THE $5.59 THAT WAS LEFT AND THE MONEY WE RAISED WITH THE CAKE RAFFLE AND 50/50 WE RETURNED $190.00 TO AREA. WE DISCUSSED THE UPCOMING HALLOWEEN EVENT, IT WILL BE HELD AT FAIR FIELD EAST ON OCTOBER 25, 2014, THERE WILL BE A SPEAKER, H & I WORK SHOP, LIVE DJ, COSTUME CONTEST, CHILLI COOKOFF, WE DISCUSSED AND VOTED ON A $3.00 DONATION AT THE DOOR BUT NO ADDICT TURNED AWAY TO HELP RECOUP SOME OF THE MONEY'S THAT WILL BE SPENT, WE ALSO DISCUSSED AND VOTED ON HAVING T-SHIRTS PRINTED AND SOLD AT THE FUNCTION. BOTH PASSED UNANIMOUSLY. 12 OUT OF 12 THAT WERE PRESENT AT SUBCOMMITTEE. WE ALSO DISCUSSED MAKING A MOTION TO AREA FOR THE FUNDS TO HAVE THE HALLOWEEN FUNCTION. IT WAS ALSO BROUGHT UP THAT WE ASK FOR DESSERTS FROM HOME GROUPS. Greetings from the web. Everything is going great - both the web and print versions of the area meeting schedule are up to date, region has been notified of all area meeting information changes, and all received announcements have been posted to the blog. Any upcoming announcements, activities, or meeting changes should be emailed to gtowebservant@gmail.com. If you have any questions, please let me know. The logo on the print version of the area schedule has been fixed and should now print without pixelation. - Grateful to serve, Jason L.
world services, and the 8 pocket literature rack and IP’s put up and Barboursville Library to the left of the checkout counter. The location seems to be beneficial to reaching potential members and it was very generous of the Library to give our fellowship this location. The 16 pocket rack that needed refilled at Cabell County is now fully loaded. We are going to look to Wayne county and Guyandotte to make contacts and discuss what literature could benefit in those facilities. Greetings from communications. Cabell county contacts were called and we are in good standing with them all. A day for schedule distribution was set and our contacts were looking forward to seeing us this month. We will be adding a new contact to Cabell County at Northcott court. Contact Bateman and Psych unit at ST Marys. About literature and contacts for PR Next loved ones group aug 16 Barnett center Stephanie requested 20 schedules, dropped off by Ryan D website logo was voted and updated on. it was discussed and decided that our best solution to reach potential newcomers and ultimately members in the psych unit, was for PR to provide 50 white booklets to Vicki and help her locate basic text and other literature, motion for area to provide 37.50 plus 5 shipping for a total of 42.50 for 50 white booklets for St Mary’s Psych Unit. The next loved ones group has been set with contact: cary for Oct 14thto share in a Loved one’s group please contact Ryan D.
Nick L brought flyer for VA Homeless Veterans Stand Down September 11th the next year’s event. Grateful to serve, Rachel N.
Rebecca Nurse Manager unit 4 Substance abuse unit ext. 294- Eli, Tanner and Ryan to make contact with facility to build relationship. Public relations met with a new contact at St Mary’s psych unit. The contact is Vicki-Kelly Moore. Date: August 17, 2014 By: PR Subcommittee Chair- Ryan D.
Motion: PR motion to purchase literature rack 300 IPs and 25 white booklets approximate total of 99.65. For Barboursville library and restock of Cabell county library. PR motion $18.00 to reimburse for purchase of 300 area schedules for upcoming schedule day 8-21-14. 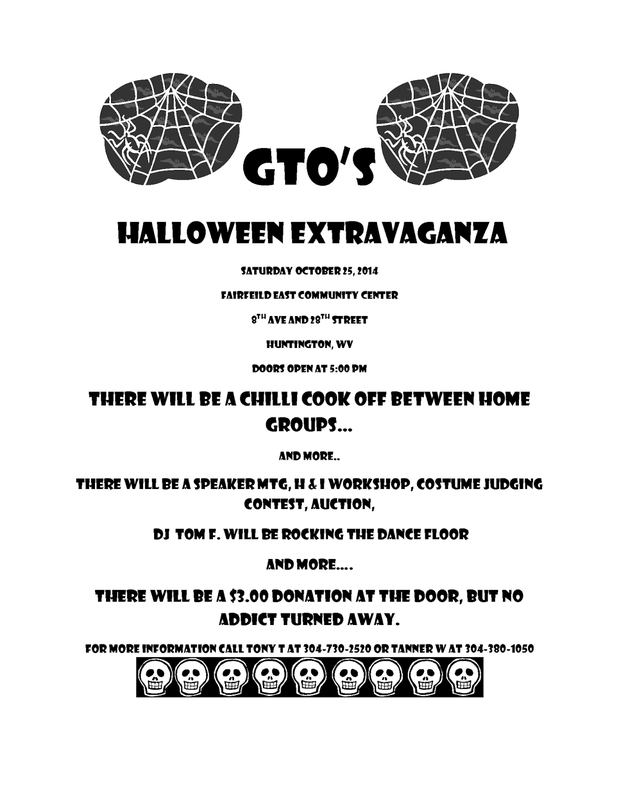 Date: August 17, 2014 By: Activities Subcommittee Chair- Tony T.
Motion:Activities Chair request funds for upcoming Halloween Party for facility rental. Date: August 17, 2014 By: Against All Odds Home group-Robbie C.
For area to provide 20 Regional schedules to all home groups monthly with the intent to further the message by helping newcomers locate meetings and to go into area policy. Date: August 17, 2014 By: Not High Noon Home group- Brittany O. Date: August 17, 2014 By: Against All Odds Home group- Robbie C.
Motion: Request Area purchase key-tags for new group Small Town Big Recovery. Second by : Joe M.
Terri M. discussed new IP from world called An introduction to NA meeting which is now available. Date: September 21, 2014 H and I Subcommittee- Deeidra G.
Motion for $20 to purchase regional schedules for panel members. Date: September 21, 2014 Activities Subcommittee-Tony T.
Date: September 21, 2014 PR subcommittee- Ryan D.
Date: September 21, 2014 By: Another Chance to live-Robbie C.
Motion: We would like to bring to the floor for policy change. The new policy to have new meeting before being put on Area Schedule to be changed to one time. Show up and be put on. Reason: This policy goes against our primary purpose of carrying the message and seems to govern over scheduling. This policy change would help us carry the message to the addict who still suffers better and would help the new meeting with its attendance. - ILS Robbie C.
Date: September 21, 2014 By: Hope turns to faith- Nick L.
Hope turns to faith home group will be paying to send a newcomer to convention. A new meeting showed up and requested to be put on schedule. The meeting name is "Out of the Dark and into the Light of the Rainbow." 619 6th. Av.7pm Saturdays.